My recent dragon fixation has shifted to dinosaurs. I’m not sure how I got the itch to combine dinosaurs and yarn, but I’m apparently not the only one. There are some amazing dinosaur patterns out there, in a full range of styles. For fast and cute, you can’t beat these adorable crocheted baby brachiosaurs (free pattern) designed by Jana Whitley. 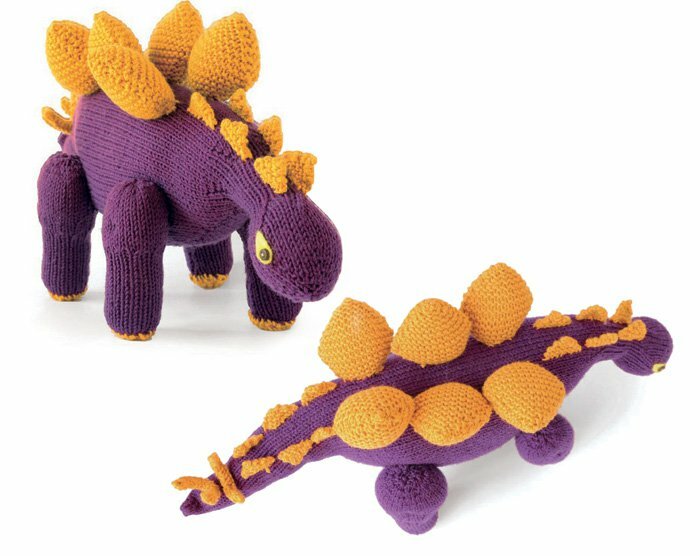 You can also knit a more complex and stylized stegosaurus (free pattern) designed by Tina Barrett. If you want a more practical dino, how about a hat? Free patterns are available for both crocheted (Danyel Pink) and knitted (Kris Hanson) hats with dinosaur spikes on top. Of all the dino knits I found, however, my favorite is Christine Grant’s Tracy Triceratops, which has the level of detail I love in an animal knitting project. While I’m sharing fun dino-knits, I can’t pass up sharing Katie Bradley’s charming tortoise “cozies”. 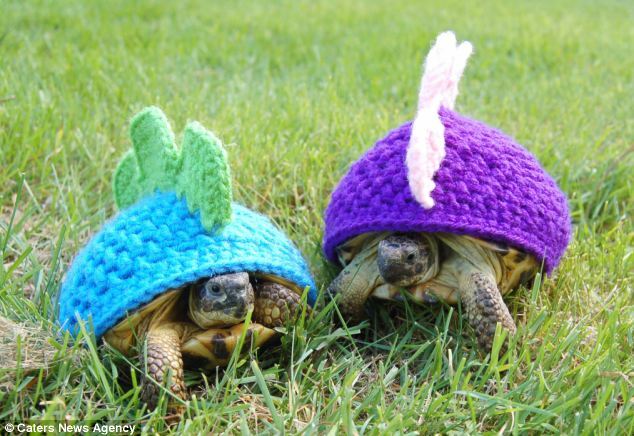 She knits these covers (or costumes, depending on how you look at it) for her many pet tortoises. She’s made them pumpkin covers, shark fins, and, of course, dinosaur spikes. To get the full fun of her creations, watch this short video of her pets modeling their cozies. I’m not willing to tell you what exactly I am up to with my own dinosaur knitting project. So here’s a teaser picture to give you a hint. 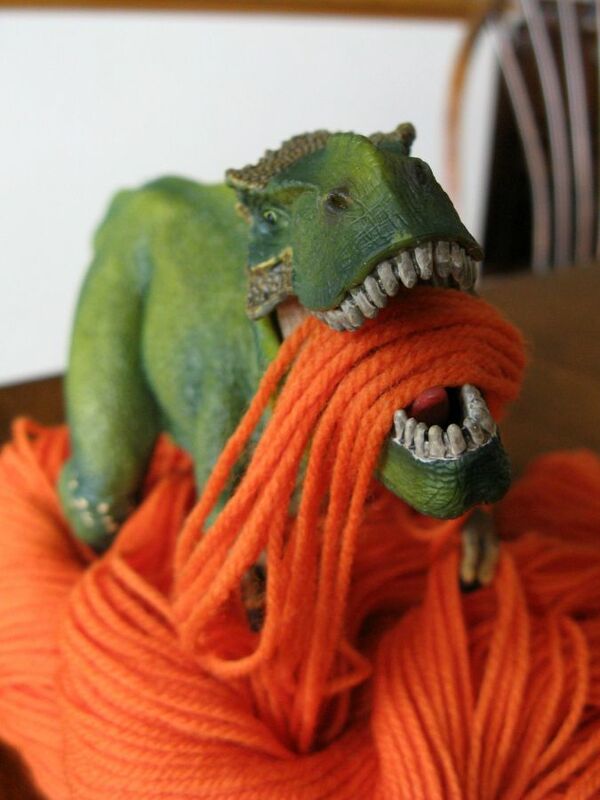 Tyrannosaurus Rex + yarn = ??? Any dino-knits in your life? Feel free to share them here. Although maybe I can just try to make one with crochet. The crochet pattern is only one set of spikes instead of two, but I think both the knit hat and the crochet hat have their appeal.